Just like the Leo Baby, Scorpio Babies must be the centre of attention. This baby is quite clear on what he/she wants and can get the message across quite clearly even if it involves some form of manipulation! As your child grows a little older, you may notice his/her tendency to become secretive and you may never learn all about what makes your little one tick because Scorpios rarely reveal everything. Scorpios have such range and depth of feeling – you will understand your child better if you accept that he/she may never tell you everything. 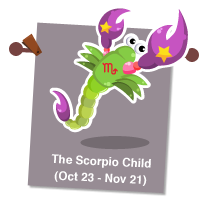 As parents, guide your little Scorpio to constructive activities and forging balanced relationships with others.